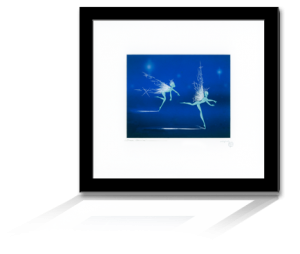 Once again, Courvoisier Galleries© brings the finest Disney animation art to your collection, with all of the original tradition, beauty, and excitement you have wished for. Every Courvoisier Studio Replica© begins with an original Disney production animation drawing. The image is completely hand inked from the drawing onto an animation cel, with inks formulated to the original Disney color keys. The inked image is entirely hand painted, using the historic Disney color keys, and finished with original touches in the traditional manner. Each Studio Replica© is presented in a traditional hand-lettered Courvoisier mat finished with the "Original WDP" seal, and is accompanied by a signed Certificate of Authenticity. Optional S/R Signature Framing® is available, as shown. Ron Stark demonstrates the art of the airbursh in creating a background for "A Smile and a Song"
Welcome to Courvoisier Galleries®. If you are new to collecting animation art you have probably heard the name Courvoisier applied to certain pieces of older art. If you are a veteran collector you already know Courvoisier stands for some of the finest vintage animation art available today. But no matter what your collecting experience, there is a great deal to learn about this unique and historic program, which introduced thousands of pieces of the very best Disney animation art ever seen to the world. Much of the vintage animation art in collections today exists solely because of Courvoisier, and much of the way we think of animation art is because of the way Courvoisier presented it. In 1937, Courvoisier Galleries gave Disney animation art the magic touch it needed to be considered fine art. Find out how you can be part of the Courvoisier tradition!